A few weeks after Lecretia’s funeral, when the flowers had died and the phone calls became less frequent and the dinner invitations fewer, I found myself sitting around home a lot, drinking a bit, listening to music, doing nothing. I didn’t want pity, or sympathy, or ’to talk about it’. The only thing I wanted was the impossible – for the needle to skip a groove, to drop into a different reality from the one I was in, where Lecretia was still alive and well and with me and none of the last six months had ever happened. I knew I was stuck and that I needed to do something. So I forced a change and I disappeared. I booked flights to the other side of the world, giving myself fewer than seven days before I left. I kept things open-ended. 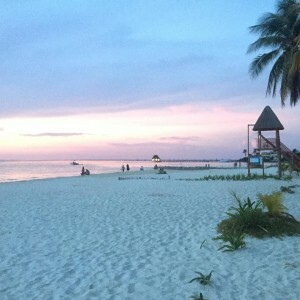 I started in the Baltic Sea, progressed to Denmark and Iceland, then to New York, and whilst there I chose to push my flights out and spend five wonderful weeks in Mexico, going west from Quintana Roo all the way to Mexico City. I visited places that Lecretia wanted to see, like St Petersburg and Manhattan, and visited places just for me. I was away for ten weeks in total, living out of a backpack, meeting new people and seeing new sights. I lost weight. I grew a beard, a big ginger one. I ate at some of the world’s top restaurants, and ate street food barely fit for anyone. I swam under the midnight sun in the clear blue lake of Laugarvatn, and descended into the dormant volcano at Þríhnúkagígur. I saw the New York skyline from the Top of the Rock and watched a jazz master play the drums at the Village Vanguard in New York. I played pool in Mexican beach bars late into the night, and explored Mayan ruins in jungle thick with macaws. Some days I spent in contemplation, others I filled with activity to keep my mind from dwelling on my late wife. I spent time with good friends in New York and a few came to visit me on the coast of Mexico to laze with me on golden, deserted beaches. It was wonderful and healing, but every seemingly perfect moment was suffused with a single thought: Lecretia would have loved this. I found myself anticipating how she might react to things: fear, surprise, joy, delight. One of the hardest things while travelling was seeing Christmas decorations. Lecretia used to love buying Christmas decorations from foreign countries. She liked the idea of decorating a Christmas tree with decorations from all over the world, and that, if she had kids, she’d be able to tell the story of where and when she bought this or that decoration. Seeing such things out there in the world – I just know how much it would have excited her. Seeing things that would make her happy, and for her no longer to be able to see them, is the thing that wounds me the most. While travelling it seemed like Lecretia was merely in another place, out of contact, but still present somehow. It was coming home that was harder, because when I got here I felt her absence more keenly. Everything is the same, nothing has changed, except Lecretia is no longer here. And it is obvious that she is no longer here. And it hurts like hell because there’s no one I want to talk to more right now. There’s not a day that goes by that I don’t think of her. But it’s only when I dwell on the sad times that I’m overcome. Most of the time I reflect on happy memories and they just bring happiness for having happened. It’s those last days that are hardest to deal with, the ones where Lecretia entered her terminal decline and we could do nothing but make her comfortable and helplessly watch. There were happy moments even in that though, when she’d smile or laugh or surprise us all by saying something, but mostly it was just unfair, unfair, unfair. I’m not angry: who or what can you be angry with? But what it feels like is a waste, how could someone so beautiful and intelligent and kind crafted over forty-two years be undone in a few short months? What would she have done with another thirty years? I wish I could have given them to her. There’s no denying that Lecretia’s efforts have started something big. There’s a Health Select Committee enquiry underway. David Seymour has put his End of Life Choice Bill into the ballot. It has a couple of chances of being drawn before the end of the year. Along with Mr Seymour, a few other party leaders, including John Key, Andrew Little and James Shaw have expressed support for a law change, though in all cases they are speaking for themselves and not their parties. I had a chat with someone today, a healthcare professional, who was very clearly in favour of Lecretia having the choice she wanted. Here was a person on the front lines, working with a lot of dying patients, and completely familiar with the gap between the rhetoric and the reality of palliative care, as Dr Rodney Syme calls it. They knew and felt that a patient having that choice was not going to interfere with them being able to do their job, that it’s arrogant in the extreme to deny a patient choices, and yet the organisation that purports to represent them holds a completely inconsistent view. Sadly, given the number of doctors and nurses I’ve spoken to who are supportive and would want the choice for themselves are frightened into silence for fear of being reprimanded by these associations. It’s only when doctors or nurses find themselves in a terminal situation, such as well-respected Auckland doctor John Pollock in 2010 or Australian palliative care nurse Ray Godbold earlier this year, that they find the bravery to speak out about the choices they want. I think some of these professional associations need to take a good hard look at themselves and figure out whether they really reflect the varied views of their members and what those members would want for themselves in a terminal situation, or whether their executives are using their position as spokespeople to advance their own beliefs. If that’s the case, I hope their membership summon the bravery to recognise that and call them out. Because it really isn’t on. I was also touched today to read the story about David Stephens in Canterbury, who is bravely speaking up about wanting some choices about the end of his life. My first wish for the courageous Mr Stephens of course is for a full recovery from his illness, and the best medical care and attention possible in support of that. But I do believe that if his illness takes a bad turn and he finds himself in a situation that is untenable to him, he absolutely should have a choice about how his life ends if he meets the necessary criteria and his wish is consistently held. Everything should be done to make Mr Stephens as comfortable as possible, to maximise the quality of life in every day he has. It sounds like he still has a lot to live for. If that’s done, he may decide that he doesn’t want or need to be assisted to die and that he’s happy to die naturally. And that would be a good outcome in some tragic circumstances. But he should still have some choice and control of his own destiny, like any of us would want. Now that I’m back from travel I’m committed to doing what I can to help people understand why choices at end of life are important, and how empowering they are. With everything going on right now, I really am filled with hope that somehow and some way we will achieve some change. I remain optimistic. If you’re wanting to make a submission to the select committee (please do! ), I’ve collated some information about the process here. 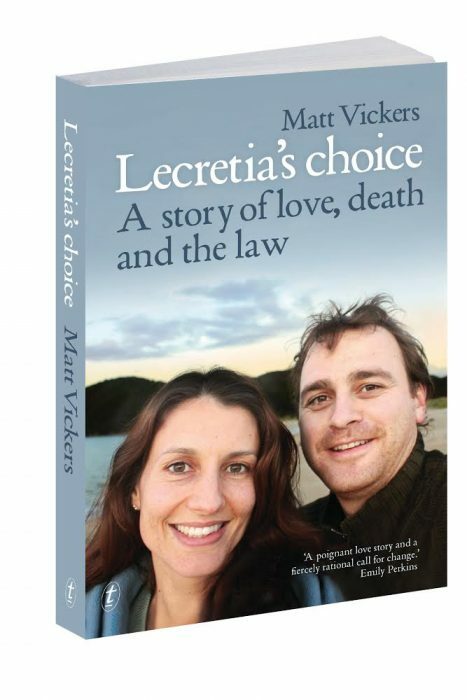 With the help of Lecretia’s fantastic legal team I’ve also put together a huge summary of all the findings and evidence in Lecretia’s case, which I hope will be a really valuable resource for people. I am so grateful to those people who have already prepared submissions, as it’s really important to do that if we’re going to see any change in the law. Please consider writing a submission. Beautifully Written – You’re a strong and compassionate Man. I didn’t know Lecretia but Im sure she would be very proud of you. My submission was sent, so hopeful change will be close. As Dee said this was beautifully written. You are an amazing person and as Lecretia watches over you she would be especially proud. I will definitely look at putting in a submission. Stumped for words to be honest…. Lecretia would be very proud i’m sure. Matt, I too am stumped for words but the tears are flowing. You are an amazing man. I know what the loneliness is about. Keep yr head high and your wonderful thoughts flowing and your amazing insights into this sometimes very sad world. Thinking of you. Good on you for taking the plunge and going to the other side of the world. I absolutely admire anyone who can travel alone, I dont think i could do it. And especially after all of what you have been through, is even more admirable. Keep writing, people do read, it will help not only others, but yourself. Matt, I did the same after Yoka died – went to Europe for 6 weeks. I took some of her ashes to her mum in Belgium. And I met with some of the people who helped craft the right to die law that was successfully introduced in 2002. People are the same the world over and want the same things. To be able to die with dignity, when the pain and suffering becomes unbearable. We’ll win this fight – it’s now only a matter of time. You write so beautifully. I’m glad you had a big trip away. You will have been exhausted. I am working on a submission. Thank you Matt for taking the time to let us all know how you are going and what is happening with the euthanasia process. I think the hardest thing I find with grief, is watching others carry on with life around me, it seems or feels like I have stood still or in a different reality. I to am so impressed with the way you are able to articulate your thoughts and feelings. I was glad to read your post this morning as I have thought about you often over the last few months. And I hope with the gentle passage of time, that the gnawing pain of Lecretia’s passing will lessen. Such a loss. Thank you for sharing your thoughts and feelings about your sadness and loss. This is such a moving piece to read. Thank you too for the efforts you are making to build on Lecretia’s valuable legacy. Amazing and very moving words. I wish you Matt all the very best for the future. Lecretia certainly had an amazing husband. Thanks Matt. I can’t help but wonder if the large ginger beard you grew was one of the things that Lecretia would have wanted to see. I recommend you read a poem by Brian Patten called So Many Different Lengths of Time. You will never forget Lecretia but I hope you begin to remember the love and happiness you shared.